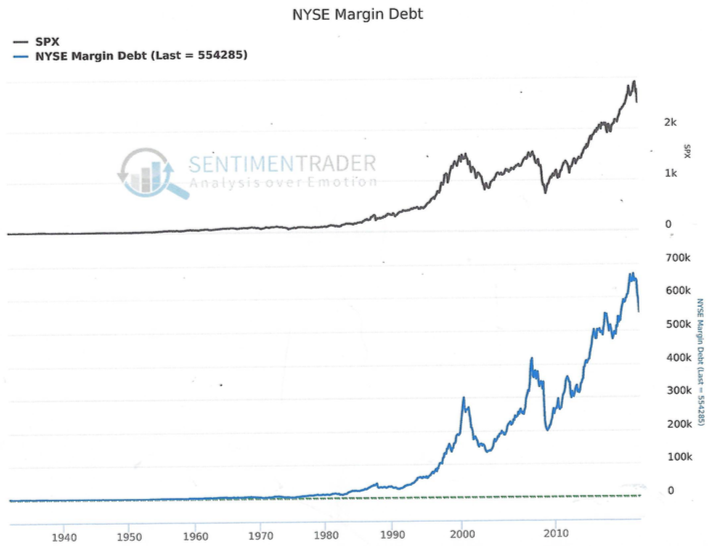 Although margin debt has declined a bit, this chart from Sentiment Trader indicates that it is still close to all-time highs. That’s despite many warning signs that the stock market is overbought. Why is this worrisome? Very high margin often precedes major market declines. It also means a lot of stock is in the hands of weak handed investors who are taking outsized risks that would subject them to market calls and outsized losses when the markets decline. In fact, high margin accelerates market declines. That’s because leveraged investors are forced to sell stock into down markets to meet margin calls. Note that margin spiked in March 2000 at the time of the dot.com crash. It also spiked before the financial crisis in 2007.